Share edged higher close to 18% and thanks to the multis combined share was close to a win on 27.3%. Home and Away ended its week just over 702,000 as the new arrivals at Summer Bay continue to debate the merits of the move. Toddlers Make You Laugh Out Loud couldn’t do better than third in the timeslot with 542,000. The Front Bar backed off a little this week with 148,000 in Melbourne after 189,000 last week. Sam Pang was away this week with Fitzy taking his spot at the front bar while former Essendon great Paul Salmon worked at the back bar. 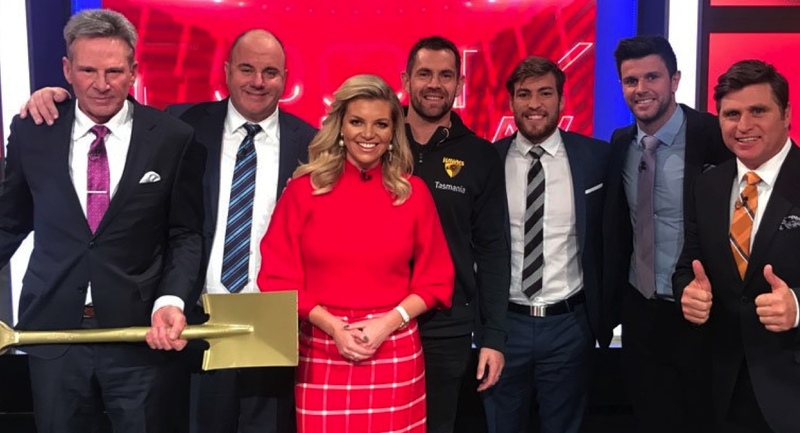 The show trailed The Footy Show across the hour. Seven streams the program into other markets while it didn’t get a FTA screening in Sydney until midnight on 7mate. At 8.30pm other markets saw All Round To Mrs Brown’s, a talk show featuring the characters from Mrs Brown’s Boys. The metro audience was 527,000 with Melbourne getting the episode at 9.30pm. Pamela Anderson and James Blunt were amongst the guests on the first episode. Nine has now won every night so far this week in primary and combined channel share. Its week-to-date primary share is 28.8% and combined 36.2%. A Current Affair was on 787,000 after starting the week with two nights over 900,000 and then a night off for Origin pre-game coverage on Wednesday. Martin King was at work early in the episode in his continuing coverage of the Karen Ristevski murder investigation. RBT was next with 639,000 after 592,000 last week. The Footy Shows had a combined 479,000 with 96,000 in Sydney and 184,000 in Melbourne. The Sydney figure is not a great result but perhaps understandable if some rugby league fans have temporarily lost their appetite for the game after the performance from the NSW team in Origin 3. 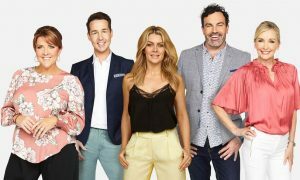 The Melbourne number is still short of where they would like to be, but it won its timeslot and was well up on the past two weeks where it had been under pressure from Seven’s The Front Bar. Get this – the best guest on The Project came in the first 30 minutes. WWE female wrestler Sasha Banks promoting a forthcoming WWE tour. The program had much to offer too with Rove again guest-hosting and then the stars of Baby Driver, Ansel Elgort and Lily James, on set. The Thursday episode did 545,000. MasterChef was fascinating with the final battle to see who would make it to finals week starting on Sunday night. Eliza Wilson should have been watching safely from the sidelines after avoiding the bottom three earlier in the week. However, Sarah Tong had an immunity pin and she used it, given she faced elimination. Eliza, Tamara and Karlie all subsequently faced off and prepared good dishes giving the judges a hard decision to make. They settled for Eliza who was sent home after managing to avoid elimination challenges until the second-last Thursday of the season. The episode had a healthy 895,000 watching, making Thursday again the most-watched episode of the week. Episode two of Common Sense followed, starting with old timers in a retirement home. The episode did 342,000 after launching with 467,000 a week ago. An episode of The Checkout: Best Before did 430,000 at 8pm. Janet King really did end its short eight-episode season at 8.30pm with 480,000, after we initially reported it wound up a week ago. Great British Railway Journeys pushed just over 300,000 and was not far off a top 20 spot. It was into the mountains for stage 12 of Le Tour de France with 189,000 watching. Viceland’s share jumped from 1.1% to 2.7% week-on-week thanks to coverage of the Arsenal v Sydney FC match with an audience of 160,000.